Bob Williams holding the first ever Analogue Systems product, the FB3 Filter Bank. 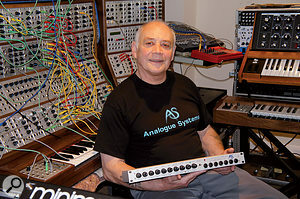 Like many of us, Bob Williams can identify the moment when he became hooked on synthesizers. It was 1970, and he was listening to a single by Dave Dee, Dozy, Beaky, Mick & Titch that featured a weird and wonderful sound generated by an early Moog synthesizer. The future of the young Williams — and, to some extent, that of the English synthesizer industry — was decided. Two years later, Williams saw Brian Eno performing 'Virginia Plain' using an EMS VCS3, and this stimulated a visit to Macari's music store in Charing Cross Road. Relieved of a small fortune in cash but now heavily burdened by a VCS3, an EMS DK2 keyboard, a WEM Copicat and an HH amplifier and speakers, he returned to his home city of Coventry, a journey which perhaps also set him on his other career of bodybuilder and gymnasium owner. In 1974, Williams no doubt garnered popularity with his neighbours by selling all of his musical equipment and moving to Cornwall. But the twin lures of home and synthesis were too great, and he resurfaced in Coventry in 1978 with a small motorbike shop (which is not as irrelevant as it may seem), a Roland RS202, SH5 and EP20, a Vox Continental and a Jen SX2000. The acquisition of a Multimoog then resulted in the eternal ultimatum, "it's me or the keyboards,” so he got rid of his girlfriend. Over the next few months, she was followed out of the door by the bike shop and, surprisingly, the keyboards, and he headed off to Cornwall again. Fourteen years later, Williams had become co-owner of a bodybuilding gym. He was also playing again, but he wasn't enjoying his digital synths, and was dismayed by the rate at which their values were plummeting. At this point, his earlier ownership of the motorcycle shop became significant. He remembered how British bikes had dominated the market in the 1950s before becoming almost valueless when the Japanese invasion of the 1970s destroyed the indigenous industry, only to be rediscovered in the 1980s as collectors' pieces and icons of the good ol' days. Could the same be true of clunky old synths, whose major advantage over clunky old bikes seemed to be that they didn't leave nasty oil stains on your mum's living-room carpet? Williams took a gamble, swapped his digital gear for the best analogue synths he could find, and then found that his bodybuilding allowed him to carry his Yamaha CS80 into his music room, eventually to sit alongside heavyweight friends such as a Moog 3C and a full Roland System 700. Williams and a British ex-pat living in Los Angeles then formed Analogue Systems to source analogue rarities in the USA and import them into the UK. The collaboration was brief, but Williams had another trick up his sleeve. Tony Wride, who would later become the manufacturer of the short-lived Aviator monosynth, was a commercial airline pilot who also worked with Williams to source synths in the USA. Williams also turned toward Europe, forming a relationship with Michael Thorpe of Touched By Sound, who helped him to source yet more high-quality equipment from Germany and further afield. Before long, rumours began to circulate about a museum in Cornwall and, in 1993, an article in Music Technology magazine described Williams as 'The Curator' of analogue synths. This attracted the attention of a chap named Martin Newcomb, who would later earn his own, albeit fleeting mention in British synthesizer history. Newcomb contacted Williams, flew down to Cornwall, bought his Roland 700 on the spot and then, over the ensuing months, proceeded to ravage the collection. 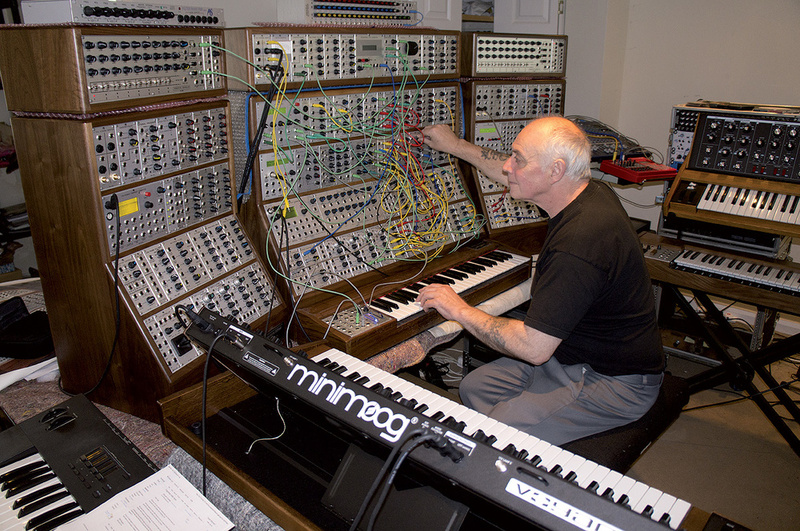 Given the funds available to Newcomb, the next stage was perhaps inevitable: he decided to build a Museum Of Synthesizer Technology, populating it with Williams' pristine collection and additional instruments acquired for him by Williams from the USA, Europe and Japan. Martin Newcomb's Museum of Synthesizer Technology was an impressive, albeit short-lived, venture which brought together Bob Williams and synth designer Steve Gay. Short-lived though the museum was to be, it was an impressive venture, and it's unlikely that a more formidable array of synthesizers has ever existed in the UK. Unfortunately, on any given day there were numerous sick keyboards awaiting surgery so, even before the museum opened its doors to the public, Williams needed someone to keep the collection functional. He was introduced to a former EMS engineer, Steve Gay, who was also living and working in Cornwall, and it was Gay who was to become the second major player in the Analogue Systems story. Before he met Williams, Gay had been developing several rackmount audio devices. Although none were released commercially, Williams saw their potential and decided to remould Analogue Systems as a synthesizer manufacturer. They launched their first product, the FB3 Filter Bank, at the 1994 Frankfurt Musikmesse. The show was a resounding success; Williams sold a unit to a member of Tangerine Dream, and a Japanese dealer was appointed before the week was out. The museum opened its doors a few weeks later, and Williams and Gay set to work on their next AS product, the TH48 Sequencer, which was to echo the look and feel of the iconic ARP 2500. Launched at the 1995 Musikmesse, this elicited great interest, especially at Frankfurt Airport, where customs officials seemed determined to reduce it to a zillion parts as they attempted to work out whether it should be the centrepiece of a controlled explosion. It's fair to say that Williams, with cropped hair and the musculature of a long-time bodybuilder, was not putting them at their ease, but man and machine eventually arrived home safely, and the TH48 was put into production. Next, the team turned their attention to ideas of a synth expander, the Legacy, that could be interfaced with the TH48 and other synths and sequencers. But before development was complete, Gay suggested to Williams that he write off the existing development and start afresh with a more flexible design that could include all of the Legacy's functions, but much more beside. 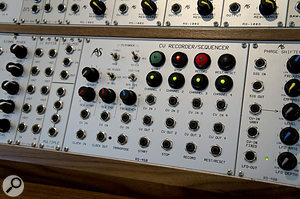 They started by splitting the FB3 into its constituent parts — a multi-mode filter, an LFO, a mixer and a multiple — to build a Modular Filter Bank housed in a standard Eurorack case. 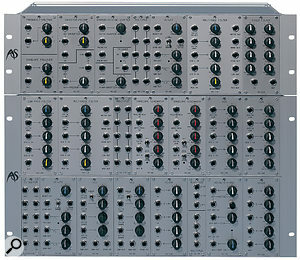 Williams has since admitted that, while he sometimes feels nostalgic for the 5U format and quarter-inch sockets of earlier modular synths, not everyone has the musculature of a medium-sized ox, and a smaller format made much more sense in terms of size, weight, cost and functions per square inch. 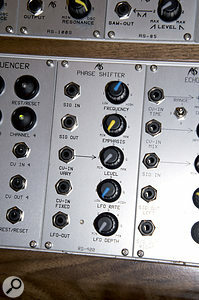 Gay then developed three further modules (an oscillator, a VCA and a contour generator), and together, these comprised the modules in the RS Integrator System 1. Williams showed this to Martin Newcomb, who immediately commissioned one of the largest modular systems ever to be built; before the world had even heard of the Integrator, the pride of place in the Museum Of Synthesizer Technology was to be handed over to 'the Phoenix'. 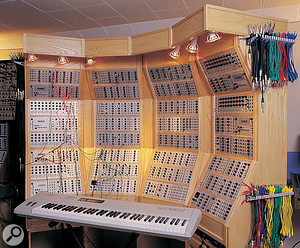 The centrepiece of the Museum of Synthesizer Technology was Analogue Systems' one-off Phoenix modular. 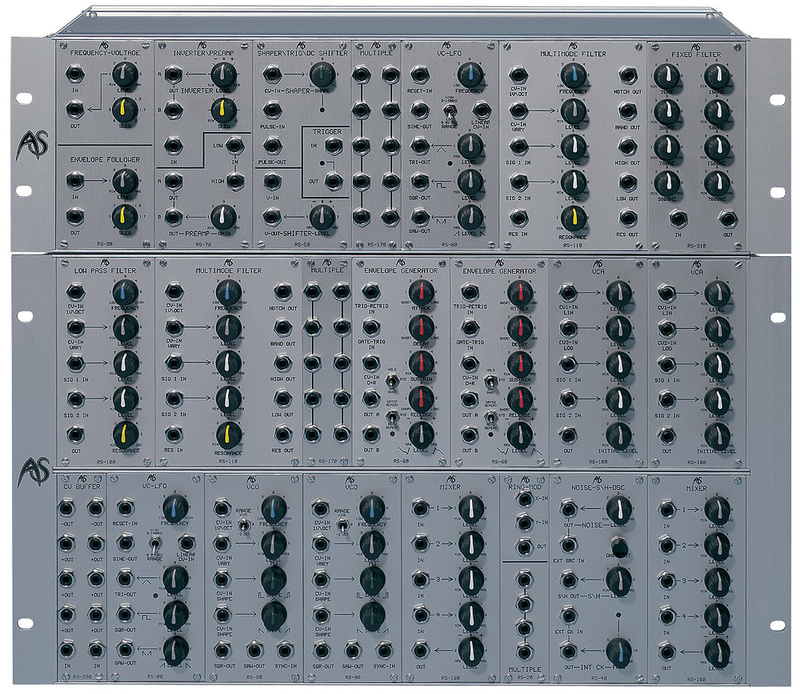 For those without museum-sized budgets, the Integrator represented an affordable yet hugely powerful introduction to the world of modular synthesis. Newcomb engaged a professional cabinet maker to craft his designs in solid African walnut and the result, inspired by the famous TONTO synthesizer, was a broad sweep of panels with a matching base and a canopy for lighting. It was an enormous undertaking and there were many teething problems, primarily with the power supplies but, when the Phoenix was unveiled, it generated a stream of enquiries regarding smaller systems. Williams realised that housing manageable configurations in high-quality wooden cases would put them in a different class, so he set about manufacturing a pair of walnut cases for his RS modules (the RS8000 and RS8500), plus smaller cabinets for the newly developed RS200 Sequencer. The response was remarkable, and he found himself swamped with enquiries and on the road seven days a week demonstrating and delivering synthesizers. Meanwhile, back in Cornwall, development was continuing apace, and many further modules were released, including the RS240 Bode Frequency Shifter that Newcomb had requested for the Phoenix. By the end of 1996, Williams found that he owned a thriving synthesizer company. Up until this point, Williams and Gay had concentrated on sound generation, but there was a growing need for controllers, so they developed some. The first to appear were the Demon and the Sorceror, both of which were crafted in walnut to match the larger synthesizers' cabinets. In addition to numerous Control Voltage and Gate sockets, the Demon offered MIDI In and Out (which would later be extracted to become the RS140 MIDI/CV Converter module) and a dedicated joystick module. The Sorceror was even more advanced, with room to mount a complete System 1 (or other modules of your choice) within the keyboard cabinet itself. 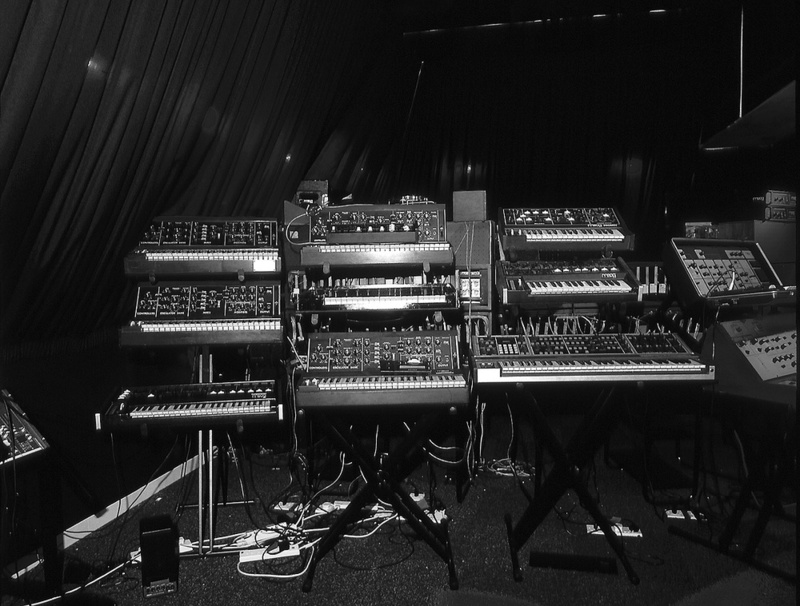 Then, in 1999, Williams drove to Oxford with an RS8000 system and a sequencer cabinet, to drive away a few hours later minus the equipment but with Radiohead as one of his growing list of high-profile clients. It turned out to be a propitious relationship because, when Jonny Greenwood wanted a keyboard based upon the Ondes Martenot, it was to Analogue Systems that he turned. Thus was the French Connection born. Fortunately for his customers, Williams was not an analogue die-hard, and he realised that if the Integrator was to reach its full potential, it would need to incorporate a range of digital modules. First among these were a Sampler/Delay module and a Digital Echo, followed by a CV-to-MIDI converter (that's not a typo) and, in 2004, the RS370 Polyphonic Harmonic Generator, a unique product that bridges the worlds of analogue and digital synthesis. But while the last of these was a labour of love for Williams, it was to prove a development nightmare for the company's new software writer, Leslie Newell. The RS370 was inspired by the Kawai K3, a six-voice synth that combined digital waveform generation with an otherwise analogue signal path. But by the time Williams had finished refining the concept and Newell had ironed out the problems, its prototype had grown into a 24-oscillator monster complete with six 10-stage envelope generators and their associated VCAs. But Williams had still grander ideas. Feeling that the module could become a fully fledged synthesizer in its own right, he decided to add additive synthesis to its pre-defined waveforms, plus control using analogue CVs and Gates. He then decided that it should function as a six-voice MIDI/CV converter and then, just as the development appeared to be reaching a conclusion, demanded the addition of an arpeggiator, dual LFOs and wavetable synthesis. Somehow, Newell avoided a nervous breakdown, and three modules duly appeared: the RS370 itself, plus its associated RS375 and RS376 Expanders. Analogue Systems had entered the world of digital synthesis. In 2008, Williams saw Alison Goldfrapp use her voice (on the single 'Your Lovely Head') to control Will Gregory's Korg MS20. He liked the effect so much that he decided that the Integrator should be able to recreate it, and the RS35 External Processor was born. 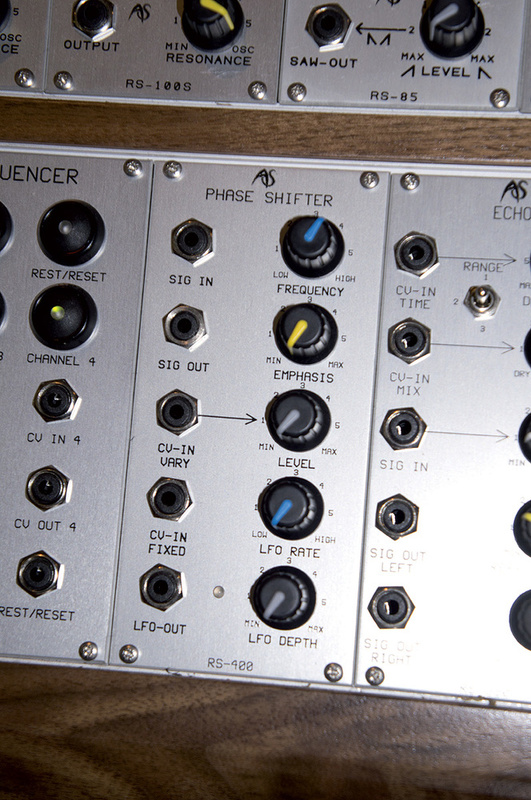 The RS35 External Processor was designed to allow voices and other instruments to be used as synth controllers. Capable of tracking pitch more quickly and more accurately than the vintage devices that it emulated, it has since been used by guitarists, so the Integrator entered the world of guitar synthesis too. But despite the power of the Integrator, some customers wanted to explore higher polyphony than was possible using existing configurations, so a new mega-system was conceived. 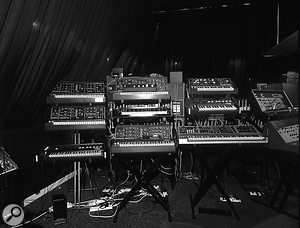 Eschewing the height and some of the cost of the Phoenix, this was to comprise six cabinets arranged like a Roland System 700, plus three controller keyboards. Williams dubbed this Goliath. Analogue Systems' latest mega-modular is dubbed Goliath, and incorporates a number of innovative digital modules, as well as conventional analogue oscillators, filters and processors. Initially, he chose a Roland A50 MIDI controller to provide Goliath's polyphonic keyboard capabilities, but he felt that it looked out of place, so when the Moog Voyager XL appeared, Williams purchased one of these plus a Moog MP201 pedal, and Goliath was almost complete. The missing element was the RS450 Recorder/Sequencer (see 'Almost-a-Synthi' box) that Williams and Gay feel is the last piece in the RS jigsaw. When this appeared earlier this year, the range of RS Integrator modules was deemed complete. Currently used as the centrepiece of Analogue Systems' training facility, Goliath is a hugely powerful synthesizer, and it's unlikely that it will ever be fully explored. The main cabinet alone contains 50 modules and, if needed, the synth can be further augmented using a pair of FB3 filter banks, a pair of TH48 sequencers, and a Spawn (see box) put aside for this purpose. Analogue Systems has even received two tentative orders for Goliaths, but to fulfill these would have an impact on existing orders, so we will have to wait to see whether Williams will ever build them. Among the more unusual modules in Analogue Systems' current range are the RS450 CV Recorder/Sequencer, the RS400 four-stage phaser, and the RS130 Programmable Scale Generator. While Analogue Systems will never operate on the same scale as the likes of Korg, Roland or Yamaha, they have proven that boutique synth manufacturing need not be limited to super-quirky products of interest only to socially inept teenagers hiding in their bedrooms. 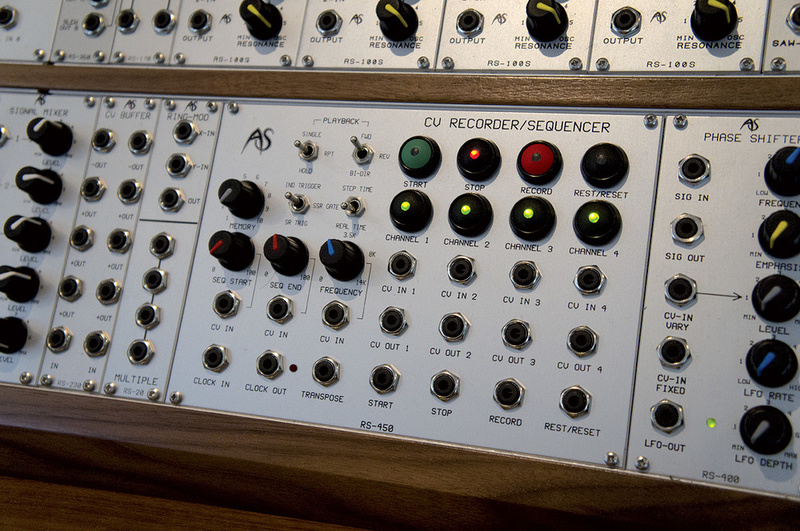 And, despite the disdain of the larger-format (5U, quarter-inch socket) manufacturers and their fans, AS's success is evidence that in numerical terms, at least, the Eurorack has become the standard format for modular synthesizers. Indeed, with numerous systems and hundreds of loose modules being shipped every month, the company is now the most successful British synthesizer manufacturer of all time. Given that it's run by a man who used his experience of vintage motorcycles and professional bodybuilding to make some particularly astute decisions along the way, I think that it's fair to say that good ol' English entrepreneurialism is alive and kicking. 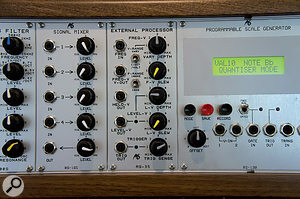 In 2002, Analogue Systems released the short-lived and under-rated Spawn synthesizer. Designed by Andy Pledger (who later manufactured his own modular synth range), with some tweaks and fine-tuning from Steve Gay, this 2U rackmount used little of the existing AS technology and offered a different sound from the Integrator. 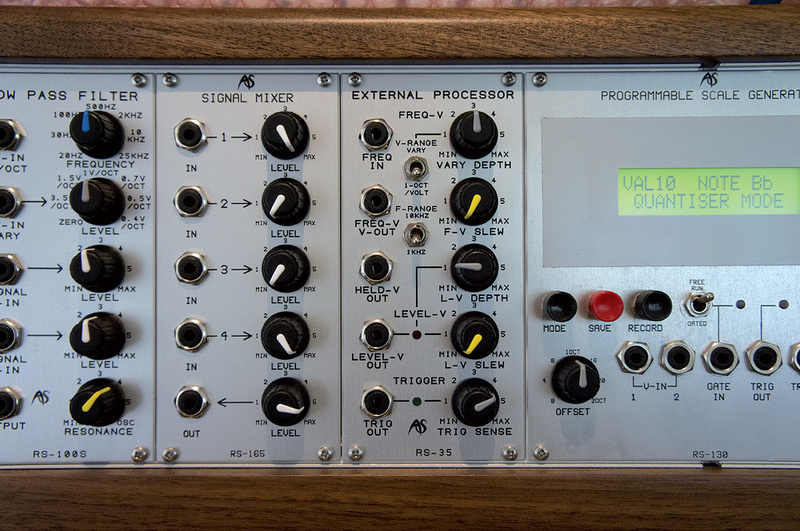 It was pre-patched so that novices could create useful sounds almost immediately, but its 37 patch points broke the internal connections, meaning that it could also be used as a modular synth comprising a VCO, an LFO, a LPF, a VCA and an ADSR contour generator. Analogue Systems' client list is a Who's Who? of our industry, comprising the likes of Aerosmith, Autechre, the Chemical Brothers, Goldfrapp, Hans Zimmer, the Human League, Korn, Linkin Park, Maroon 5, Muse, Nine Inch Nails, Portishead, Pulp, Radiohead, Red Hot Chilli Peppers, the Scissor Sisters, Sigur Ros and Stereolab, as well as Eon Productions (producers of the James Bond movies) and Rockstar Productions (the software company behind Grand Theft Auto). 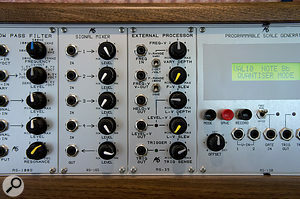 In 2003, Analogue Systems released the RS500E Synthi filter module and the RS510E Trapezoid Generator. Built under licence from Robin Wood of EMS, these made it possible to recreate many VCS3 sounds on the Integrator. The next stage was to update the standard RS95 oscillator by adding a vernier tuning knob, and something approaching a Synthi (albeit with patch cords rather than a pin matrix) was beginning to take shape. However, the system lacked a CV sequencer of the type offered in the Synthi AKS, and it would be a few years before the RS450 CV Recorder/Sequencer (in essence, an EMS KS sequencer with memories and increased recording times) would appear. Developed by Gay and Newell, this was designed to feel as close as possible to the original, while providing a range of extra facilities more in keeping with the 21st century. 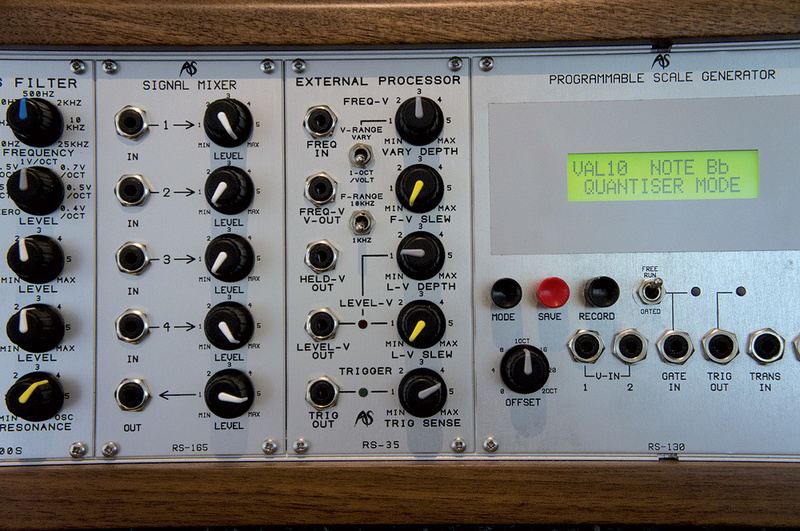 Unbeknown to Bob Williams and Steve Gay, Dieter Döpfer had been thinking along the same lines as them in the early '90s and, shortly before the Integrator, the Doepfer A100 appeared. Williams has been asked on numerous occasions whether a collaboration would have been sensible but, since neither party knew what the other was doing, the question didn't arise. In retrospect, this is a shame, because there are two important architectural differences between the synths. The first is the configuration of their power cables and the other is the position of the mounting holes on the modules' panels, which leads to overlaps or small gaps if the two brands of modules are mounted directly adjacent to one another. To overcome the first of these problems, Analogue Systems later redesigned their power supplies to provide eight Doepfer-style outputs so that the systems could be mixed and matched (small gaps notwithstanding). May 2007: Yet more new modules!